Part of the point of going back to this location, which I briefly visited during the first year of the series, is to roll in some photos and locations we've visited in the meantime. In this year's posts, starting March 16, and running through March 26, I showed and discussed a couple of outcrops of probable ignimbrites that only recently began to make sense to me. Since then, I've been posting photos from our trip of October 9, 2012, at McKenzie Junction. The photo above is from a trip, amusingly, two years to the day after that, when Dana, B, and I stopped again at that same spot. This shot, though, is probably the best one I have to illustrate the western half-graben of the High Cascades Graben, or more clearly, the western fault system that allowed the subsidence of the modern High Cascades. At least it's the best close-up I have of the structure; my best photo of it was from near the top of Sand Mountain, in 2013. (And for comparison, Green Ridge in this post/photo is the eastern half-graben. 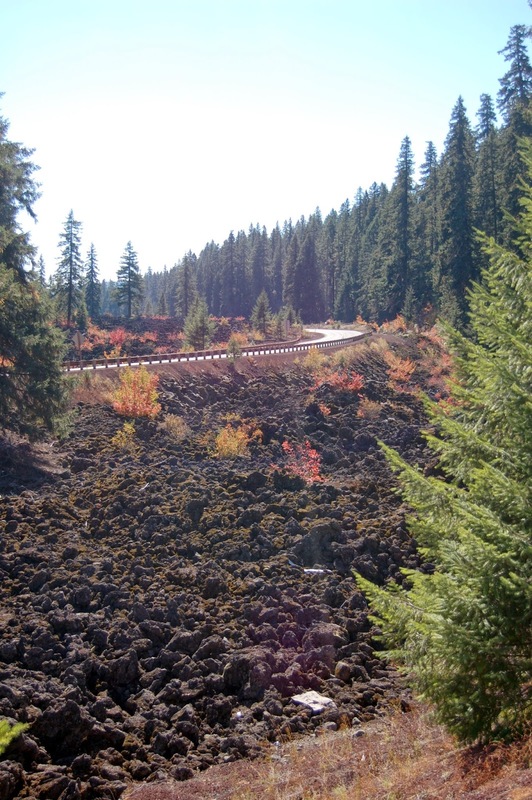 Black Butte is a large cinder cone that erupted along that fault.) Here, we're looking pretty much directly south along the fault zone, which is largely hidden under these young lava flows. A short distance down the road, we encountered warning signs regarding a fire burning in the area, and the haze in the trees is apparent. Photos run through Paint.Net's autolevel routine for contrast and saturation. October 9, 2014. FlashEarth Location.